It’s been a busy first quarter at ATE Solutions. On the sales front there are some exciting developments; We have secured one of our largest single orders to date as well as an additional 4 high value orders. “January, February and March have seen us produce a quote per day” says MD, Steve Lees. 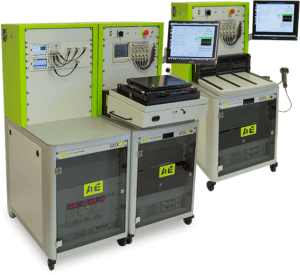 “I believe this increased interest is mainly due to growing awareness of our test expertise and our philosophy of developing test solutions based around our modular Flex system, which continues to be a big hit with customers.” Built on PXI instrumentation platforms and typically deploying industry-standard test interface hardware, the company’s Flex products are used in an impressive array of applications across the UK. Our production facility has been exceptionally busy developing and building Flex systems ready for customer delivery. This hectic period has seen the delivery of a number of systems including two Flex 30s, one in the UK and one into a European based contract manufacturer. Both of these were legacy replacement systems for testing high voltage PCBs – replacing 20 year old semi-automatic pieces of equipment that had become too difficult to maintain. We also secured a Flex 40 system order for testing the flight electronics in a military training aircraft – testing the PCB’s that make up the flight computer and then the completed system. The finished unit is nearing completion and will be delivered soon. Anticipating this increase in sales we have taken on two new test development engineers, one in our Chippenham office and one in our Northampton facility. “2018 is shaping up to be an exciting year for ATE Solutions” adds Steve Lees. “Our Company continues to grow both in reputation and revenue, and we are hugely optimistic about hitting our target of double last year’s turnover”.